Whether you’re the manager of a local convenience store, restaurant, or hotel chain, it’s important to maximise the efficiency of your commercial refrigeration equipment. Not only will this help to avoid food spoilage and waste, but it will also significantly improve the day-to-day performance of the refrigeration system – reducing your average energy costs and saving on the costs of repairs. In the following blog, we offer top tips on how to improve your commercial refrigeration efficiency and explore how our team of experts, here at J&M Refrigeration, can help with this ongoing process. If the door seals and gaskets on your commercial refrigerator have become worn or damaged, cool air will start to escape from the unit. This can also happen if the door has become misaligned, and it can have a very negative effect on the system’s overall efficiency. Try to check the seals on your commercial fridge door on a regular basis, perhaps by feeling for any draughts of air or inspecting the inside of the unit for condensation and moisture. If you suspect a seal or gasket has been compromised, it is a good idea to replace this as soon as possible. It can be tempting to load your commercial refrigeration unit with lots of products; however, overcrowding can have a very detrimental effect on the system’s efficiency. It will need to work much harder to circulate cold air and, as such, it will start to use excessive amounts of energy. You should limit the number of products that are stored or displayed at any one time and try not to push items to the back or sides of the unit, as this can hinder the overall circulation of air. Placing your commercial refrigerator in a warm environment can significantly affect its efficiency and effectiveness. Essentially, the system will need to work harder – and for longer periods of time – in order to keep your products cold and this is bad news for your future energy bills. It’s a good idea to consider the location of your new equipment carefully. Make sure there is adequate space around the unit as this helps air circulation, and try not to position the unit in a naturally warm environment (e.g. a kitchen) or next to hot machinery and equipment (e.g. an oven). It is vital that you care for your commercial refrigeration equipment properly. A build-up of dust can block airflow and lead to maintenance issues and, as such, the unit should be cleaned on a regular basis. You should also arrange a professional service for your system, at least once every six months. Here at J&M Refrigeration, we currently offer a range of planned preventative maintenance contracts. These contracts are designed to make sure that everything is in full working order, reducing the chance of equipment failure and optimising the efficiency of your system. Due to advances in technology, commercial refrigeration equipment has come a long way in the last decade. Units are now 85% more efficient than they once were and, if you haven’t already done so, now is the perfect time to upgrade. You may be reluctant to spend money on a brand new system, but it is a very worthwhile investment and can lead to fantastic savings in the long run. J&M Refrigeration has a comprehensive range of energy-efficient commercial refrigeration products to choose from. Whatever the specific needs of your industry, we can recommend the best upgrade for you, and our experts can provide advice and guidance on how to maintain its efficiency. Get in touch with J&M Refrigeration today! If you would like to find out more about commercial refrigeration efficiency and the products and services currently available at J&M, please feel free to get in touch. Either call us today on 0121 544 0555 or send an email to admin@jamrefrigeration.co.uk and we will respond as soon as possible. At J&M Refrigeration we design, manufacture and install a massive selection of commercial refrigeration products. We offer our services to a wide range of industries and businesses from all around the country. No matter what items you wish to keep refrigerated or frozen we have a vast collection ideal for application in a number of sectors. The refrigeration products we supply, install and maintain come from world-leading brands so you can rest safe in the knowledge that your stock will be kept at its optimal temperature. This post takes a look at the various forms of commercial refrigeration that we offer and the particular businesses and industries that they are suited to. When it comes to the hospitality and leisure industry the best commercial refrigeration products are our bar refrigerators and back bar coolers. Ideal for use in a hotel bar, a pub or a club, this range is produced to include glass doors which allow customers to be able to see the items you have in stock. This makes them perfect for behind your bar as it can prompt an impulse purchase. Other features of the range are they that have hinged doors for ease of access and that they can include numerous shelves to allow you to more easily organise the drinks you have for sale. Another range that is popular amongst businesses in the hospital industry is our selection of ice machines. 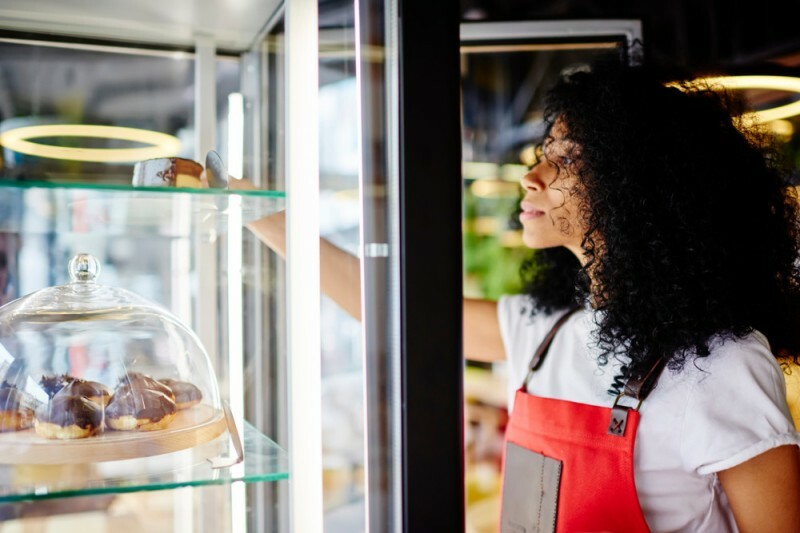 If you own a business in the food retail or manufacture sector then the ideal commercial products for you would be our assortment of glass door cabinets and display freezers. If you own a butchers, bakers or supermarket then your customers must be able to see to the products you have for sale. If they cannot see what is for sale, they simply will not make any purchases. Our selection not only ensures your stock is visible to your customers but that it remains fresh and is stored at optimal temperatures. Island freezers are also fantastic for use in this sector. Cold rooms and walk-in freezers and fridges are the perfect type of commercial refrigeration product if you have a business in the healthcare or pharmaceutical sector. We offer cold rooms of numerous shapes and sizes to suit the needs and specifications of our customers and their premises. Our highly efficient assortment of products are also incredibly secure. They can include lockable doors to ensure that your stock is safe and that only members of staff with the correct levels of clearance may be able to enter the facility. As with many other items which are part of our service we can provide shelving to allow you to properly arrange the different things you sell. If you would like to learn further information about the best commercial refrigeration products depending on the industry or sector your business is in then please do not hesitate to get in touch with our helpful, experienced team. Give us a call on 0121 544 0555 or alternatively contact us via email at admin@jamrefrigeration.co.uk. We can also talk you through our 24/7 maintenance provision.